The time finally came for the promised Saviour of the world to appear on earth. 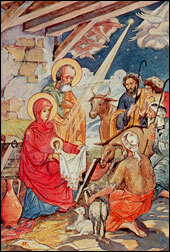 He was born at night, of the Holy Virgin Mary, in the city of Bethlehem, in a cave which was used for sheltering cattle. 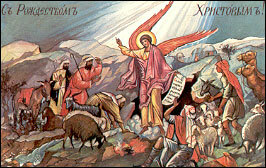 An angel of the Lord brought the news to shepherds who were tending their cattle that night in a field not far from the cave. Together with the divine messenger there suddenly appeared a host of angels. They glorified God and sang: “Glory to God on high and peace on earth, and goodwill among men.” The shepherds rushed to the cave and knelt before the Infant Christ. Two thousand years have passed since that blessed night, in which the angel announced the great joy that would come to all people. And in the course of these 2,000 years the Holy Church, while annually reliving the exultation of that night in Bethlehem, tells us over and over again of what happened, and that it was truly a great joy. But what is the essence of that joy? In the very beginning of mankind’s existence, when Adam and Eve dwelled in the garden of Eden, they lived in such a state of bliss that we, in our current sinful condition, cannot even begin to comprehend. They had the joy of speaking face-to-face, like children with their father, to God Himself, Who put aside His inaccessible majesty and appeared to them very simply, as a Father to His beloved children. But through the malicious envy of the devil, the first-created people sinned and lost that bliss, and were expelled from paradise. Then the Lord, in His infinite mercy, did not wish to abandon His beloved creation. In order to save man, who had fallen away from God, the Lord Himself came down to earth, to become man and to take on a form in which He would once again be easily accessible to men. And so today there lies in the manger in Bethlehem the Divine God, Who is also man. As God He is inaccessible and awe-inspiring, and even the angelic host does not dare gaze upon Him; yet at the same time He is a man like us, similar to us in all but sin. Therefore, since the One Who lies in the manger is a man and at the same time the Son of God, - then we, being His brothers by virtue of His humanity, through Him have now also become the sons of God. Therein lies the deep significance of Christ’s incarnation. The Apostle Paul tells us that God sent His Son down to earth, in order for Him to redeem us, so that we could once again become His children. We - all of mankind - were foresworn sinners, but He came, took our sins upon Himself, atoned for all of us, and now we once more possess the grace of being the sons of God. Thus, mentally standing on this great day at the manger of Bethlehem, we realize with joy and awe that we are not only God’s creation, but also His children. And let us remember with immense gratitude that the Lord has mercifully done such a wondrous deed, and that instead of punishing man, who was guilty of sin, He not only took that punishment upon Himself, but more than that - he affiliated man to God the Father. Let us love the newborn Infant Christ with all the tenderness of our soul, as our Saviour and our Redeemer, and let us bring Him the gift of our pure and loving heart. Adapted from the sermons of Metropolitan Philaret (Voznesensky). Down to earth came the One Who in the beginning had created us out of dust and had filled us with His divine spirit; the One Who with a single word caused all visible and invisible things to appear out of nothing, Whose word brought into existence all the birds, fish, four-legged animals, insects, all the creatures who live under His almighty providence and guardianship; the One Whom the mighty host of angels serves everlastingly with awe and joy. And with what humbleness He came! He was born from a poor Maiden, in a cave, was swaddled with simple cloths and placed in manger! O wealth, celebrity, fame of this world! - bow down, kneel with humility, tender tears and deep gratitude to the Saviour of mankind, share your wealth with the poor and the indigent, and put aside your pride in your ephemeral and quickly-passing celebrity: only virtue possesses true nobility. “And brought Him gifts: gold, frankincense and myrrh” (Matt. 2:11). It was customary in the East to bring gifts to prominent people. The Queen of Sheba visited Solomon and brought him aromatic oils, much gold, precious stones, etc. That is why the Wise men brought gifts to the Infant Jesus and gave them to His Mother. And in our times, some carry on the tradition of giving presents to each other on the Feast of our Lord’s Nativity. What gift would be the most pleasing to our Lord? Let us look at the treasures which the Wise men brought – can we not imitate their example? Firstly, they brought gold – the most precious metal. But King David says that God’s Word is more precious and more desirable than precious gold. This means that if we study God’s Word and preserve it in our hearts, we have a gift which to the Lord is more precious than gold. This is His gift – Truth; there is nothing more precious than that. Secondly, they brought frankincense. This is a kind of fragrant incense which by God’s command was used in the Old Testament tabernacle and in the temple. It has a very pleasant fragrance; rising to the heavens like clouds, it serves as a gift of thanksgiving, pleasing to God. If we bring our gift of thanksgiving to God, as the Psalmsinger says, would it not be more pleasing to God than frankincense? Is not our soul, sending the fragrance of thanksgiving to the heavens, worth more than incense? Finally, the Wise men brought myrrh.. Like frankincense, it is obtained from trees growing mostly in Arabia. To obtain it, the tree bark is cut and from it comes an aromatic sap that is used as part of the fragrant oil with which kings and high priests were anointed. The word myrrh means bitterness or sorrow. Could not we, too, bring such gifts to the Lord? Do we not sorrow and feel remorse over our sins? Heartfelt sorrow over our sins – this is our myrrh. Thus we, too, can bring to our King the same gifts which the Wise men brought to Him: gold, frankincense and myrrh. We can bring Him God’s truth in our hearts, as King David says: “Your word I hid in my heart.” We can sincerely thank Him for coming down to earth to save us. We can confess before Him our sorrow over our sins, for which He had died. If we do so, then we will be as wise as the magi, and we will bring Him real gifts – true gold, incense and myrrh. In that very year, almost 2,000 years ago, when the Lord Jesus Christ was actually born on earth, mankind gave Him the very best and most precious gift it had – the Pure Virgin Mary, the only One Who could become the Mother of God and Who could help Him achieve His incarnation. Since that time, however, within the Church the Lord continues to be born for us every year, and every year He comes down to earth for our salvation. And thus every year, in gratitude, we must offer Him some gift. The second step is the observance of Christmas Lent. But this observance should not be solely in terms of food. The main thing is to keep spiritual lent in terms of the heart, i.e. restrain ourselves from anger, resentment, quarrels, irritation and other passions – from everything that darkens our souls. Through spiritual lent we proceed even further to purify and enlighten our hearts. And then the last and highest step towards acquiring a pure heart is to partake of the Royal Mysteries. In the sacrament of communion we draw into ourselves the Lord God Himself, the Sacred Fire that consumes all of our inner uncleanliness and gives that purity of heart, toward which we are striving. Therefore, it is extremely important in this period of Christmas Lent to come to church and take communion. The incarnation of the Son of God from the Virgin Mary radically changed the world for the better: it provided people with a new way of thinking, ennobled their mores, set world events upon a new course. It poured into the decrepit human organism a stream of Divine life and thus endowed people with eternal life. For these reasons the incarnation of the Son of God has occupied a central place among world events and serves as the focal point of chronology – time is counted before and after the Nativity of Christ. Before Jesus Christ’s nativity there was universal expectation of a Saviour. The Jews awaited His coming on the basis of prophecies; the pagans, suffering from disbelief and a general laxity of morals, also eagerly awaited an Ameliorator of human society. All the prophecies concerning the time of the Son of God’s incarnation had come to pass. Patriarch Jacob had foretold that the Saviour would come when the scepter would depart from Judah (Genesis 49:10). The holy prophet Daniel foretold that the Kingdom of Messiah would come in seventy times seven years (490 years) after the issuance of the commandment to restore Jerusalem, during the period of the mighty pagan kingdom that would be strong as iron (Dan. 9:24-27). And so it happened. By the end of the prophesied period of time, Judea came under the dominion of the mighty Roman Empire, while the scepter was transferred from Judah to Christ. Since the people, having abandoned God, began to idolize earthly goods, wealth, and glory, the Son of God rejected these worldly idols and came into the world in the humblest of circumstances. The events of the Nativity are described by two Evangelists – the apostles Matthew (from among the 12) and Luke (from among the 70 disciples). Since the Evangelist Matthew wrote his Gospel for the Jews, he set himself the task to prove that the Messiah came from the forefathers Adam and King David, as it had been foretold by the prophets. For this reason the Evangelist Matthew begins his account of the Nativity of Christ with a genealogy. Knowing that Jesus was not the son of Joseph, the evangelist does not say that Joseph begat Jesus, but says that Jacob begat Joseph, the husband of Mary, from Whom was born Jesus, Who is called Christ. But why does he present the genealogy of Joseph and not of Mary? The fact is that the Jews were not accustomed to record their genealogies along the female line. However, the law demanded that they obligatorily take a wife from the same tribe as the one to which the husband belonged, and so the evangelist, without departing from custom, presented the genealogy of Joseph, thus showing that Joseph’s wife Mary and, consequently, the Jesus Who was born from Her, come from the same tribe of Judah and house of David. Having been told by the Archangel Gabriel that She was chosen to become the Mother of the Messiah, the Holy Virgin went off to see Elizabeth while still being only affianced to Joseph. Three months already passed after the Angel’s tidings. Joseph, not being privy to this mystery, noticed Her condition, and though the external appearance could give rise to thoughts of the bride’s unfaithfulness, and though he could publicly denounce Her and subject Her to the strict punishment instituted by the law of Moses, in his kindness he did not wish to employ such a drastic measure. After much wavering, he decided to let his bride depart in secret, without any outcry, granting Her a letter of divorce. But an Angel appeared to him in a dream and announced to him that his affianced bride would give birth from the Holy Spirit, and that he should call the Son born to Her Jesus (Ieshua), i.e. Saviour, since He will save His people from their sins. Joseph accepted this dream as a vision from above, obeyed it, took Mary in as his wife, but lived with Her not as husband and wife, but as brother and sister, or rather, taking into account the great difference in their ages, as father and daughter. Speaking of this, the evangelist adds: “And all of this took place in order that everything be fulfilled that had been spoken by the Lord through the prophet, who says: Behold, a Virgin shall be with Child and shall bring forth a Son, and they shall call His name Emmanuel” (Isaiah 7:14). The name Emmanuel means “God is with us.” At this point Isaiah does not call the One born from the Virgin Emmanuel, but say that thus shall people call Him, i.e. they will say that the Lord Himself has come down to earth. The evangelist Luke notes that the time of Christ’s Nativity coincided with a census of the inhabitants of the Roman Empire, which was done by order of Caesar Augustus, i.e. Roman Emperor Octavian, who had received from the Roman Senate the title of Augustus – “the sacred one.” The edict concerning the census was issued in 746 from the foundation of Rome, but in Judea the census began in circa 750, in the last years of the reign of Herod, called the Great. The Jews recorded their genealogies according to tribes and houses. This custom was so strong that having learned of Augustus’ decree, they each went to be recorded in the city of their provenance. Joseph and the Virgin Mary, as is well-known, came from the house of David, and thus they had to go down to Bethlehem, which was called the city of David, because David was born there. Thus was fulfilled, by God’s Providence, the ancient prophecy of the Prophet Micah that Christ would precisely be born in Bethlehem: “But thou, Bethlehem Ephratah, though thou be little among the thousands of Judah, yet out of thee shall He come forth unto Me that is to be ruler in Israel, and Whose provenance is from the beginning, from the days everlasting” (Micah 5:2). According to Roman law, women were subject to a head count for the census on a par with men. For this reason Joseph did not go alone to Bethlehem to be recorded, but together with the Holy Virgin. The unexpected travel to the hometown of Bethlehem and, moreover, a travel on the eve of the Infant’s birth, served to convince Joseph of the fact that Caesar’s decree on the census was a tool in the hands of Providence, ensuring that Mary’s Son would be born precisely in the place predestined for the birth of Messiah the Saviour. 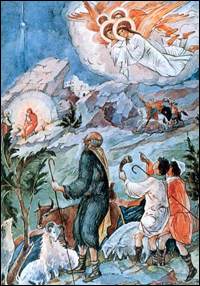 After an exhausting journey, the old Joseph and the Virgin Mary came to Bethlehem, but there was no place in the inn for the future Mother of the world’s Saviour, and thus She and Her fellow traveler were forced to settle themselves in a cave used as shelter in bad weather for grazing cattle. Here, during the winter night, in the humblest of circumstances, was born the Saviour of the world – Christ. After giving birth to Her Son, the Holy Virgin swaddled Him Herself and put Him in the manger. With these brief words the evangelist lets us know that the Mother of God gave birth painlessly. The evangelist’s expression “and brought forth Her firstborn Son” gives cause for unbelievers to say that the Holy Virgin had other children besides Jesus, Her firstborn, since the evangelists mention Christ’s “brothers” (Simon, Josiah, Judah, and James). However, it should be remembered that by the law of Moses every male infant born first was called a firstborn, even if he were also the last. Jesus’ so-called “brothers” mentioned in the Gospel were not his real brothers, but only relatives, being the children of old Joseph from his first wife Salome, and also the children of Mary Cleopas, whom Evangelist John calls “His Mother’s sister.” In any case, they were all much older than Christ and thus could in no way be the children of the Virgin Mary. Jesus Christ was born at night, when Bethlehem and its environs were immersed in deep sleep. Only the shepherds, who kept watch in the field over the flock entrusted to them, were not sleeping. To these humble people, toiling and burdened, appeared the Angel with joyous tidings of the birth of the Saviour of the world. The dazzling light that surrounded the angel in the darkness of night terrified the shepherds. But the Angel immediately calmed them down, saying: “Fear not! For behold, I bring you tidings of great joy, which shall be to all people: for unto you is born this day in the city of David a Saviour, Who is Christ the Lord.” With these words the Angel gave them to understand the true mission of the Messiah, Who did not come for the Jews alone, but for all people, since “joy shall be to all people” who accept Him as their Saviour. The Angel explained to the shepherds that they would find the newborn Lord Christ in swaddling clothes, lying in the manger. But why did the Angel not announce Christ’s birth to the Jewish elders, the scribes and the Pharisees, and summon them to worship the Divine Infant? Because these “blind leaders of the blind” had ceased to understand the true meaning of the prophecies about the Messiah, and with their exclusive Jewish pride imagined that the promised Deliverer would appear in the full glory of a majestic king-conqueror and would conquer the entire world. The humble preacher of peace and love for one’s enemies was unacceptable to them. The shepherds did not doubt that the Angel was sent to them from God, and thus they became worthy of hearing the triumphant celestial hymn: “Glory to God in the highest and on earth peace, goodwill toward men” (Luke 2:14). The angels glorified God, Who had sent a Saviour to mankind, for from that time on peace of conscience has been restored and enmity between Heaven and earth, which had arisen as a consequence of sin, has been eliminated. The angels departed, while the shepherds quickly went to Bethlehem and found the Infant lying in the manger, and were the first to worship Him. They told Mary and Joseph about the happening which had led them to Christ’s cradle, and told everyone else about it, and all the listeners were greatly amazed. “And Mary kept all these words, preserving them in Her heart,” i.e. She memorized all that She had heard. The Evangelist Luke, describing the glad tidings of Archangel Gabriel, the birth of Christ, and other events related to the Virgin Mary, obviously wrote from Her words. On the eighth day the Infant was circumcised, as prescribed by the law of Moses. Soon after the nativity, the Holy Family moved from the cave to a house, since the majority of visitors to Bethlehem had no need to stay there after the census was taken. The Gospel account of the adoration of the magi has an important meaning for the history of Christianity. This is primarily an account of Christ’s appearance to the pagans. Joseph and the holy Mother of God, together with the Infant Jesus, were still in Bethlehem when the magi arrived in Jerusalem from the far-away lands in the East. Magi, or wise men, was the name given to learned people who observed and studied the stars. At that time people believed that at the birth of a great man a new star appeared in heaven. Many pagans within Persia, having been told by the dispersed Jews, knew of the forthcoming Messiah – the Great King of Israel. From the Jews they could also know of the following prophecy of Balaam concerning the Messiah: “I shall see Him, but not now. I shall behold Him, but not nigh. There shall come a Star out of Jacob, and a Scepter shall rise out of Israel, and shall smite the corners of Moab” (Numbers 24:17); here “Moab” represents the Messiah’s enemies. 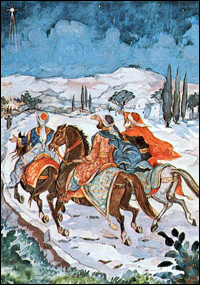 The Persian magi expected a new star to appear in heaven when the promised King was born. Although the prophecy of Balaam spoke of a star in the spiritual sense, in order to bring the pagans to faith the Lord in His mercy gave a sign in the heavens in the form of the appearance of an extraordinary star. 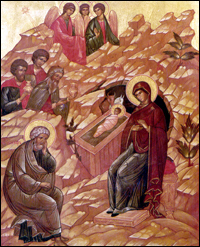 Upon seeing it, the magi understood that the awaited King had been born. After a lengthy and prolonged journey, they finally reached the capital of the Jewish kingdom, Jerusalem, and began in inquire: “Where is He that is born King of the Jews? For we have seen His star in the east and have come to worship Him.” These words of such dignified strangers excited the majority of the inhabitants of Jerusalem and especially King Herod, who was immediately informed of the arrival of the mysterious Eastern sages. From the first days of his reign Herod sat on a shaky throne. The people hated him, looking upon him as an usurper of the throne of David and a tyrant, and despised him as a pagan. The last years of Herod’s life were further complicated by personal misfortunes and bloody reprisals. He became inordinately suspicious of everyone, and executed his obvious and imaginary enemies at the slightest provocation. For this reason several of Herod’s children perished, and so did his wife, whom he had ardently loved. Ailing and decrepit, Herod now lived in his new palace on Mount Zion. Hearing of the newborn King, he became especially agitated, fearing that people would make use of his old age to take away his power and pass it on to the newborn King. 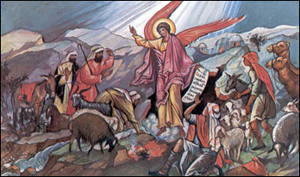 In order to determine who exactly was the new pretender to his throne, Herod assembled all the priests and scribes – people who knew the Scriptures well – and asked them: “Where is Christ due to be born?” They replied: “In the Judean city of Bethlehem, because thus it is written in the book of the Prophet Micah.” Then Herod secretly summoned the magi to him, elicited from them the time of the star’s appearance, and sent them to Bethlehem. Putting on a pious air, the cunning Herod said to them: “Go and search diligently for the Infant, and when you have found Him, bring me word again, that I may come and worship Him also.” In reality Herod was planning to make use of the information in order to murder the Infant. After listening to King Herod and without suspecting anything, the magi departed for Bethlehem. And once again the same star which they saw in the East now appeared in the sky and, moving across the sky, it went before them, showing them the way. In Bethlehem the star stopped over the place where the newborn Infant Jesus was staying. The magi entered the house and saw the Infant Jesus and His Mother. They bowed down to the ground before Him and presented their gifts to Him: gold, frankincense, and myrrh (precious aromatic oil). In the gifts of the magi one can see the following symbolic meaning: they gave Him gold as to a King, frankincense as to God, and myrrh as to a Man who was due to die. Having worshipped the long-awaited King, the magi planned to return the next day to Jerusalem and to Herod. However, an Angel appeared to them in a dream, revealed Herod’s perfidious intentions to them, and commanded them to return to their countries by another route that did not pass near Jerusalem. Tradition has preserved the names of the magi, who later became Christian. They were Melchior, Gaspar, and Balthasar. “And brought Him gifts: gold, frankincense, and myrrh” (Matt. 2:11). It was customary in the East to bring gifts to prominent people. The Queen of Sheba visited Solomon and brought him aromatic oils, much gold, precious stones, etc. That is why the Wise men brought gifts to the Infant Jesus and gave them to His Mother. And in our times, some carry on the tradition of giving presents to each other on the Feast of our Lord’s Nativity. What gift would be the most pleasing to our Lord? Let us look at the treasures the Wise men brought – can we not imitate their example? Secondly,they brought frankincense. This is a kind of fragrant incense which by God’s command was used in the Old Testament tabernacle and in the temple. It has a very pleasant fragrance; rising to the heavens like clouds, it serves as a gift of thanksgiving, pleasing to God. If we bring our gift of thanksgiving to God, as the Psalmsinger says, would it not be more pleasing to God than frankincense? Is not our soul, sending the fragrance of thanksgiving to the heavens, worth more than incense? Finally, the Wise men brought myrrh. Like frankincense, it is obtained from trees growing mostly in Arabia. To obtain it, the tree bark is cut and from it comes an aromatic sap that is used as part of the fragrant oil with which kings and high priests were anointed. The word myrrh means bitterness or sorrow. Could not we, too, bring such gifts to the Lord? Do we not sorrow and feel remorse over our sins? Heartfelt sorrow over our sins – this is our myrrh. Thus we, too, can bring to our King the same gifts the Wise men brought to Him: gold, frankincense and myrrh. We can bring Him God’s truth in our hearts, as King David says: “Your word I hid in my heart.” We can sincerely thank Him for coming down to earth to save us. We can confess before Him our sorrow over our sins, for which He had died. If we do so, then we will be as wise as the magi, and we will bring Him real gifts – true gold, incense, and myrrh.